Auditions for the Coopersville Area Arts Council's SUMMER THEATRE CAMP production of "The Lion King Jr" will take place on May 7th and May 9th from 3PM-6PM at the Coopersville Middle School Choir Room. This camp is open to all students who will be in grades 5 - 9 beginning with the 2019/2020 school year. 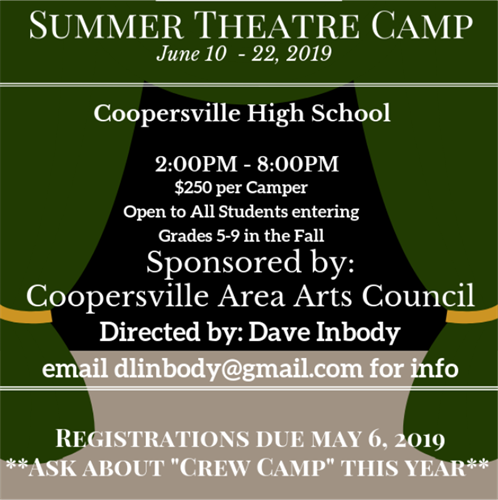 Please email CoopersvilleAreaArtsCouncil@gmail.com to have a copy of the information regarding the summer camp sent to you, or contact the Director, Dave Inbody at dlinbody@gmail.com or 616-481-8583.